Stability at the top: Panthers Chairman Dave O’Neill was re-elected to the position unopposed at a Board meeting on Wednesday. He’s in charge of both the football and leagues clubs. Panthers forward Trent Merrin, with the support of Kids Helpline, has launched a unique social media campaign to get Australia talking about youth mental health. #MoveOutOfYourHead encourages people of all ages to film themselves doing a dance and upload it to social media, then challenge a friend to do the same. Those who would prefer not to dance are encouraged to instead make a donation to Kids Helpline. “Some young people in Australia don’t know where to get help for mental illness because it’s not a topic that we often talk about or they fear the stigma of people knowing. I want to help change that,” Merrin said. Anyone keen to get more information on the project should visit www.trentmerrin.com.au/mooyh. You don’t pick an Origin team in March but Nathan Cleary already had one hand on the Blues’ number 7 jumper prior to suffering a knee injury last weekend. 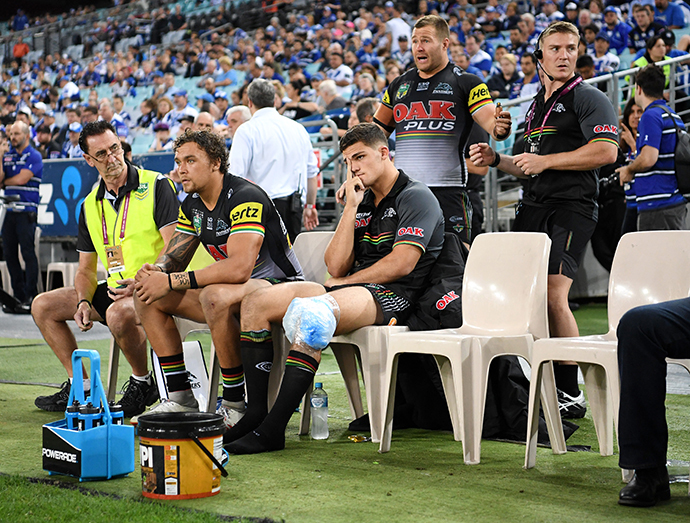 While the star halfback could face 10 weeks on the sideline, he is more hopeful of a six week recovery, which would put him back in the Origin frame. The Blues are still hopeful he’ll be there. With plenty of spots likely to be available in the Australian cricket team in the near future, could Reagan Campbell-Gillard be interested in a career switch? He was spotted at training on Monday with a cricket ball in hand. No sticky tape in sight, however. Meanwhile, it was ‘shirts off’ at training on Monday with plenty of fit bodies on show as a bunch of players took part in a friendly game of Gridiron at the Academy. As the Matt Lodge scandal continues to engulf the NRL and the Broncos, it’s been revealed how close the Panthers came to being Lodge’s new home. “I met with him six months ago,” Phil Gould told the Sunday Telegraph. “He wanted to talk about the possibility of coming home to the Panthers but I told him he owed the Broncos some time to repay the work they’d done with him during his rehab and he agreed.” Gould went on to say he would welcome Lodge at Penrith if the opportunity arose in the future. It’s a big call given the public’s reaction to Lodge’s return to the NRL, but Gus loves a redemption story. “I’ve known his history since he was a kid and it’s not pretty,” Gould said. “But this is a very different young man now. I will wait to see if he calls.” Lodge is off-contract at the Broncos at the end of this season. James Tamou plays his 200th first grade game tonight – ironically against the Cowboys, the club he called home for most of his career. The NRL has issued breach notices to two spectators who allegedly made offensive comments towards South Sydney Rabbitohs captain Greg Inglis at Panthers Stadium in Round 2. An NRL spokesman said the two spectators would now be given an opportunity to respond to the notices before any penalty was imposed. Panthers boss Phil Gould has blasted the NRL’s 6pm Friday timeslot, calling it “absolute rubbish”. Despite the NRL taking back control of the draw from the broadcasters this year, it is persisting with a 6pm game on Fridays despite it being difficult for fans to attend and generally disliked by the rugby league community. Gould said he was in disbelief that the NRL allowed the 6pm game to continue after it debuted with mixed results last season. It is however a winner for Fox League – the Panthers v Bulldogs game last Friday attracted 209,000 viewers. The Bulldogs posted a crowd of 11,000 but were clearly counting arms and legs. 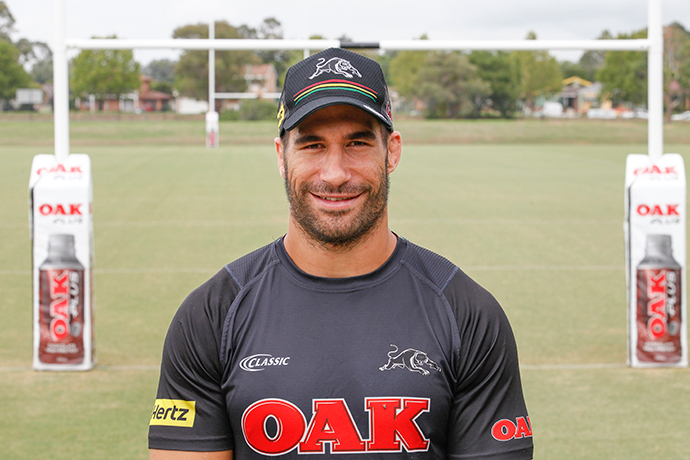 Spotted: James Tamou watching on as one of his kids made his soccer debut in the local area last weekend. 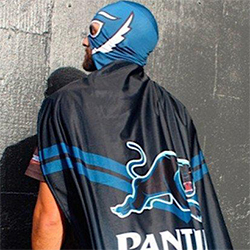 Have you spotted a Panther out and about or do you have some Panthers news? Let me know: maskedpanther@westernweekender.com.au.